I have been trying to find a good way to attach a bookmark to a card for some time now. There is a tutorial for a bookmark that is a perforated fold on a card, and then you tear the bookmark off but I’m not a fan of the perforated edge. 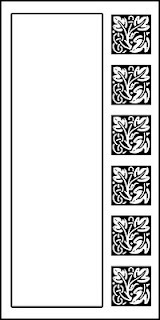 There is a tutorial for corner page bookmarks, which I may do in the future, but I wanted just a plain, traditional bookmark. This sketch was my answer. Now, I have seen tall, skinny card sketches before, but I was never drawn to them as cards. Sure, they would make great money holders, but the narrowness just isn’t my flavour. At least, it wasn’t until I saw this sketch and the light bulb when off in my head. This sketch also meets the Magical Crafts fortnightly challenge: Flower Power! I made my bookmarks in duplicate: the first one is removable and the second one is adhered to the card. My favourite memories of my mother are having a cup of tea together and playing Scrabble, which was a past-time inherited from her father. We didn’t play competitively, but just being around words and tea was stimulating and comforting at the same time. That’s what inspired this bookmark. So, my next task is to make a bookmark for children. One of the things I am most grateful for in life is the encouragement towards continuous learning instilled in me by my grandfather Chen and my aunt and uncle Quon. When I visited them as a little girl, they always emphasized how there is nothing I couldn’t do if I just take the time to learn how. My aunt and uncle’s daughter, Caren, offered to be a pen pal for my sister and I when we were girls. My sister is three years older than me and Caren is three years older than her. Caren has a brother, but she has since told me how she enjoyed when my sister and I visited because it was like having sisters. Having a pen pal encouraged us to read and write and, to this day, I think a solid ability to read and write is paramount to higher education. So, I was looking through my die cut designs for something for children. My nephew, David, enjoys pirates, so I was thinking along pirate lines. Well, I didn’t quite make it. I was looking at my skull die cuts. (I happen to love Halloween.) The skulls are perfect for sitting atop a bookmark. Symmetry is fabulous! So, instead of a children’s bookmark, I made a horror/thriller story bookmark. The colour idea came from a one of my workshop attendants (whom I work with at the firm). She had once suggested black and silver would look great. Unfortunately, I didn’t have any silver paper at the time to give her some for her scrapbooks. I have silver glitter though. After having made the first bookmark card with the glittered cup, this one came naturally. I will try again for a children’s bookmark. I do really believe that children should be encouraged to read stories. I did make a new robot die cut expressly for this purpose but I didn’t like how it turned out as a bookmark card. Back to the drawing board! Anyway, before I finish I wanted to share a tip about working with glitter. There are two ways to apply adhesive to die cut shapes: a xyron sticker maker and old fashioned tape and manually cutting it out on the tape. My favourite is the tape because I am assured even adhesive coverage that way. This tape isn't cheap though! So, here's my tip: use your off cuts to adhere your project! When you cut around your shape, you will have bits left. Use this bits as regular adhesive. It doesn't matter if they are oddly shaped. They are going on the back of the project! No one will see them anyway! Here, my sandcastle pieces to be glittered are on the right. My off cuts are placed back on to the tape backings for later use! What a neat idea to make one element of the card a bookmark. A gift and a greeting all in one.